After having a premium pergola installed on your property in St. Paul, Minnesota, or a nearby area, you’ll have the perfect shaded space to enjoy your time outside. To ensure you have an aesthetically pleasing and long-lasting shade solution installed, turn to U.S. Patio Systems and Home Remodeling. 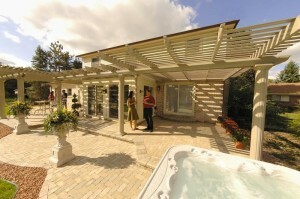 We sell and install top-notch pergolas that are sure to impress. We are confident that after we install your new pergola, you’ll enjoy being outside more than ever. Once your shade solution is installed, you’ll be able to host outdoor get-togethers with family and friends, relax in the shade and read a book, play with your children in a safe space out of direct sunlight, grow sun-sensitive plants, and so much more. Plus, our talented and experienced technicians will install your pergola in a timely manner so that you can begin enjoying your new shaded space as soon as possible. If you would like to learn more about adding a pergola to your home, contact U.S. Patio Systems and Home Remodeling today. Our specialists are available to answer any questions you have and can tell you more about all of the exceptional products and services we have available for homeowners in St. Paul, MN, and surrounding communities.